ANZAC Memorial Park was established in memory of those who served in World War One. 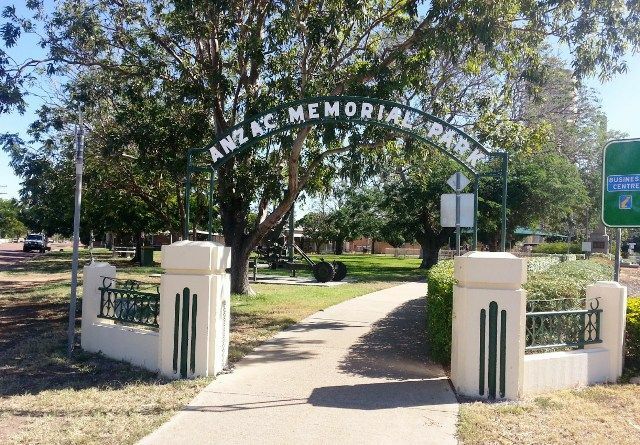 At a meeting of the Longreach branch of the Australian Labour Party, the Labour members of the Longreach Shire Council were instructed to move at the next council meeting that the park, accepted for many years as Anzac Park, be dedicated as Anzac Park. It was the unanimous decision that parks are vitally necessary. During the discussion it was stated that no objection was raised regarding fitting memorials to any citizen being erected in Anzac Park, such suggestions being originally tendered by the A.L.P. Central Queensland Herald (Rockhampton, Qld), 7 December 1939.